Educator, researcher and community activist, Mary Joan Moran is a Vancouver elementary school teacher who has had a significant impact on students in and outside the classroom. Moran earned her Bachelor of Education in 1990, Master of Education in 2002, and a Doctor of Education in 2008 from the University of British Columbia. In 2015, she received the UBC Faculty of Education Alumni Teacher Award, honouring alumni who have had an exceptional impact on the lives of their students and learning communities. For over 22 years, Moran taught at Begbie Elementary School and currently teaches Grades 6 and 7. Moran serves as head teacher, chair of the Professional Development Committee, and chair of the Staff Committee. In her classroom, Moran promotes cooperative rather than competitive learning: she allows her students to work as a team and develop interpersonal skills alongside academic ones. 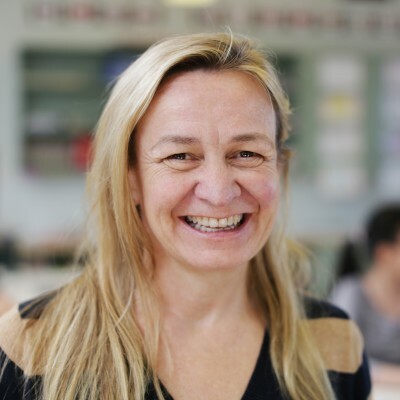 Moran finds ways to bring local, national and international social learning into the classroom. In recent years, her class participated in TakingITGlobal, a charitable non-governmental organization that promotes awareness and engagement on global issues among youth. She spearheaded multiple initiatives to bring artists-in-residence into her school, allowing students to take part in dramatic productions and art projects while fostering ties to the wider community. She organizes field trips to provide her students with experiences that would otherwise be out of reach, including ski lessons, boat trips and camping excursions. The impact of Moran’s work extends to future generations of teachers. She has given workshops for the BC Teachers’ Federation and lectured at UBC. Her doctoral dissertation is frequently used by UBC’s Department of Educational Studies to coach young teachers on the need for a creative, critically reflective learning process. Currently, Moran is mentoring her 17th teacher candidate.